Steven R. Gerbsman, Principal of Gerbsman Partners is pleased to announce a “strategic alliance” with Michael Steele, Principal of “The Steele Group”. The Steele Group is uniquely qualified to assist you at both local and national levels, networking your political and media interests. Close personal contacts with members of government, as well as national media organizations are important assets made available to address and to structure an integrated strategy. Depending on your specific needs, from media and communication to governmental affairs, The Steele Group works with you to develop the best course of action. 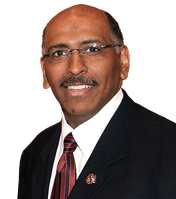 Michael Steele’s efforts focus on supporting your goals, while working to achieve synchronicity in policy approaches between you and relevant multilateral instituions, where possible. In addition to working to achieve key policy objectives, The Steele Group focuses on promoting in key public, legislative and corporate arenas, positive facts and work to create a new narrative. In announcing this strategic alliance, Steven R. Gerbsman stated “the capabilities and access to Michael Steele provides Gerbsman Partners client base of venture capital, private equity and senior lending institutions an additional resource for access to local, national political and media communities at the local and national levels”. Also, “Michael Steele is a person of high ethics and integrity and has demonstrated national and international credibility to develop and implement meaningful solutions in these challenging times”. Michael Steele noted “Steven Gerbsman and Gerbsman Partners provides an additional link to various capital providers, so that they can have direct access to the political and media establishment for maximizing value for their portfolio companies”. I am availagle to introduce Michael to your group and if appropraite, your portfolio companies so as to provide additional access for maximizing value through Michael’s contact base and experience. As chairman of the RNC, Michael Steele was charged with revitalizing the Republican Party. A self-described “Lincoln Republican,” under Steele’s leadership the RNC broke fundraising records (over $198 million raised during the 2010 Congressional cycle) and Republicans won 63 House seats, the biggest pickup since 1938. His commitment to grassroots organization and party building at the state and local levels produced 12 governorships and the greatest share of state legislative seats since 1928 (over 600 seats). Mr. Steele’s ability as a communicator and commentator has been showcased through his current role as a political analyst for MSNBC. He has appeared on Meet the Press, Face the Nation, HBO’s Real Time with Bill Maher, Comedy Central’s The Colbert Report and The Daily Show.In addition to his work in television, Mr. Steele can be heard each week on his radio program, Steele & Ungar on the POTUS Channel on SiriusXM. Mr. Steele writings on law, business and politics have appeared in The Grio.com, The Root.com, BET.com, The Wall Street Journal, The Washington Times, Politico.com, Townhall.com, The Journal of International Security Affairs and Catholic University Law Review, among others. He is the author of Right Now: A 12-Step Program for Defeating the Obama Agenda, which is a call to arms for grassroots America and co-author of The Recovering Politician’s Twelve Step Program to Survive Crisis. Born at Andrews Air Force Base in Prince George’s County, Maryland, Mr. Steele was raised in Washington, DC. Upon graduating Johns Hopkins University (‘81’), he entered the Order of St. Augustine where studied for the priesthood. He is a graduate of Georgetown Law Center (’91), an Aspen Institute Rodel Fellow in Public Leadership and a University of Chicago Institute of Politics Fellow. Steven R. Gerbsman is a nationally recognized Crisis/Turnaround CEO/Restructuring Professional and Private Investment Banker who has been involved in maximizing enterprise value, stakeholder and shareholder value in a broad variety of industries. He has worked with a wide spectrum of senior and junior lenders, bondholder groups, venture capital and private equity sources, private investors and institutional groups. He has acted in the capacity of Crisis/Turnaround CEO, Chief Restructuring Officer, Crisis Consultant, Private Investment Banker, Examiner for the Office of the United States Trustee, a member of the Board of Directors of various companies and Advisor to stakeholder groups. Since 1980, he has been in the business of maximizing enterprise value for highly leveraged, under-valued, under-performing and under-capitalized technology, life science, medical device, solar, digital marketing/social commerce and information/cyber security companies and their Intellectual Property, as well as assisting technology, digital marketing and medical device companies with strategic alliances, M&A, distribution of content and licensing. To date, Mr. Gerbsman has been involved in over $2.3 billion of restructuring, financing and M&A transactions. In 2000, he also began focusing on Israeli and European technology and life science companies, with the objective of providing access to the US capital markets and developing strategic alliances, M&A and licensing opportunities for them. In 1999, Mr. Gerbsman expanded Gerbsman Partners’ “Board of Intellectual Capital” as a resource to rapidly identify business and marketing strategies, strategic alliance candidates and financing for its client companies and their Intellectual Property. This distinguished group includes nationally and internationally recognized financial, communications, media, advertising, public relations and technology senior operating executives. Mr. Gerbsman has also assisted numerous Venture Capital/Private Equity Investors in terminating/restructuring their real estate and equipment lease executory contracts. To date, he has been involved in terminating/restructuring in excess of $ 810 million of real estate, sub-debt and equipment lease executory contracts and since 2001, has maximized enterprise value for 88 technology, life science, medical device, digital commerce, solar, information and cyber security and fuel cell companies and their Intellectual Property. Mr. Gerbsman received a BS degree in Accounting from Hunter College, New York and attended the Baruch Graduate School of Business, in New York City. Mr. Gerbsman has also been a guest lecturer at the McDonough School of Business MBA program at Georgetown University, at the Haas Graduate School of Business in Berkeley, California and a Mentor at Stanford University in the Stanford Engineering School via STVP (Stanford Technology Ventures Program) and SCPD (Stanford Center for Professional Development). He is a Director at the Kentfield Fire District, where he has previously served as Chairman.